SlowUp is a one day free event where the road around the Lake Murten or Murteensee (in German) or Lac de Morat (in French) is closed to cars. The SlowUp name come from the word ” slow down – pleasure up”. 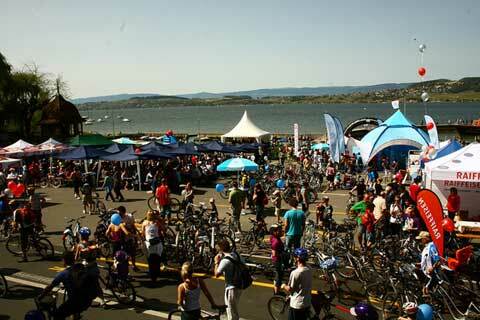 This event is part of a network of 19 SlowUp events in Switzerland that gather more than 400 000 participants every year. The 2019 edition of the slowUp Murtensee will take place Sunday April 28. This event allows to hikers, bikers and skaters to discover this beautiful area at their own rhythm on a flat trail around the Lake of Murten / Morat for 32 kilometers. Various events and food stands are organized on the circuit during the day to entertain participants of all ages. If you want to participate but don’t have a bike, you will be able to rent in Murten / Morat bikes, tandem bikes or electric bikes using the http://www.rentabike.ch/ service.